For a limited time, I will be taking on a limited number of new students who wish to study the guitar. Our goals will be to get you playing better solos while learning more effective chord choices. We will also study music theory to facilitate your own compositional ideas into your playing style. After all, improvising or soloing is simply creating melodies that work well with the harmony, rhythm, and melody of the song. 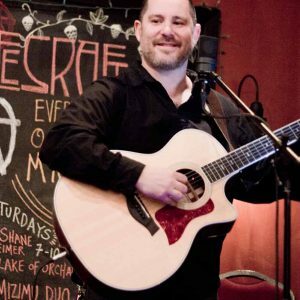 I have been practicing, performing, studying, and teaching guitar for over thirty years. I have studied multiple guitar techniques as well as music theory, and piano. I have learned many styles of music and have a great deal to offer on improvisational skills and various chord-melody approaches. I teach both electric and acoustic styles of guitar to all ages. I have been formally trained and possess a Bachelors Degree in Commercial Music. I have also undergone many years of private study. Because there is NO substitute for playing with other musicians, as a student of mine, you will gain exclusive access to the student only periodic “Jam sessions” which take place at Pinetop Recording Studio. My approach to lessons is simple. I will answer any question you may have while explaining the concepts behind it. This way you will develop your own style and personal voice on the guitar. If you know specifically what you would like to study, we can work together to get you up and running in a very short amount of time. All my lessons are 45 min long and are offered either on-premises at my studio, or online via video conferencing Skype, FaceTime, or Google Hangouts. Thank you for your interest and please fill out the form to sign up for lessons from Jeremiah Williams. ARE YOU READY? GET IT! When you subscribe you will receive up-to-date info about shows in your area, discounted tickets, raffles, and other free stuff! All information is kept strictly confidential and will never be shared with a 3rd party.